Located on a rocky hill, overlooking Paro International Airport and the Pa Chu river, Tashi Namgay Resort is set amidst five acres of Tashi Namgay resort paro buildinglush foliage and sprawling green lawns. It offers a calm and peaceful environment through amalgamation of traditional Bhutanese and modern architecture in its own unique style that also incorporates its concern for the environment as seen through the use of solar lights, wooden shingle roofing and mud walls. The resort features 39 guest rooms, which include Executive Suites, Suites, Deluxe and Standard rooms. Each room has elegant and contemporary décor and furnishings, allowing the ultimate in comfort and sophistication. Cable TV, Minibar, Telephone, Wall Heater, Hot-pot, Hair Dryer (on demand), Bath tub and separate showers (Steam bath in executive room), Internet connection. Tashi Namgay Resort also provide wide range of cuisine options, offering a unique and relaxing dining experience. From early morning to late at night, the very finest Bhutanese and international cuisines are served. It also offers a friendly and exiting pub experience, serving variety of native and international drinks with tasty snacks and luxurious seating arrangement. 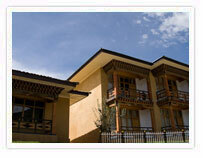 The resort also has facilities of Sauna, steam bath, traditional Bhutanese hot stone bath and meditation room. It also offers a state of the art gym with a great view of Chang Village that will appeal to both casual and serious fitness freaks. The gym is fully equipped with treadmills, multi-station gym etc. The Conference Room here include one large room with seating capacity of up to 70 people with options of creating smaller rooms to cater for lesser people. Conference Room has fully equipped state-of-the-art modern audiovisual aids with a dedicated and highly professional team. The Bonfire Garden beside the river is ideal place for relaxed evening. 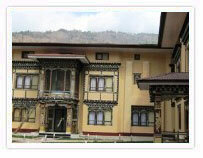 The hotel’s Handicraft shop offers a selection of Bhutan's finest regional arts and crafts. Exquisite hand-woven women's and men’s costumes, elaborate carved wooden masks, handcrafted jewelry and precious Buddhist artifacts are available. 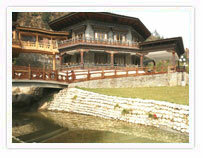 Situated in idyllic valley of Paro, about 10 minutes drive from downtown and 15 minute drive from the airport, Tiger’s Nest Resort- is a uniqueTiger's nest resort paro hotel that has incorporated the best of traditional Bhutanese design with intricate wood carvings, oak floors & staircases, stone inlaid pathway and slate roofs. Picturesquely situated amongst pine trees, the hotel has direct view of the two of the most celebrates sights in Bhutan – Taktsang Monastery and Mount. Chomolhari (7,314m). Twin or double bedrooms with heaters, telephone, internet connections, water boilers, mineral water on complimentary basis. State of the art bathrooms under floor heating with individual thermostat for temperature control, ii) telephone connections to front desk, dining, housekeeping; conference, iii) bath tub with hot/cold running water, towels, shampoo etc. Front porch or verandah with rustic outdoor bar overlooking the Paro valley to the south and the famous Tiger Nest monastery etched in the rocks at 10,000 ft from the valley floor; for those who cannot make the Taksang hike-the hotel location provides great views . Established in 1974 for guests invited to the coronation of His Majesty the King Jigme Singye Wangchuk, Hotel Olathang is Bhutan’s largest Hotel Olathanghotel sprawling over 28 acres of wooded land situated atop a hill overlooking the visually stunning and historically fascinating Paro valley. The hotel is beautifully located amidst blue pine forests and lush greenery exuding an ambience of peace and tranquility, enthralling visitors with its close intimacy with nature. The architectural design and structure of its facilities presents a purely Bhutanese touch and feel to it, at the same time maintaining modern amenities, ensuring guests a warm and comfortable stay. Also included are attached bath, IDD telephone, internet café’, laundry, heating, television, shopping, room service, money exchange. Situated at beautiful location, 4 kilometers from Paro town and affording to offer privacy and peace, Namsay Chholing resort offers 40 Namsaychholing resort parocomfortable rooms with panoramic view of Paro valley. Tenzinling Resort is an intimate, family run resort at a strategic location giving a bird-eye full view of the Paro valley with a spectacular Paro Dzong in the background.tenzingling-resort-Paro All the 21 rooms have been oriented to give the view of the Dzong. Built in the ancestral land, the resort is surrounded by a small village amidst apple orchards, and rice fields. Hotel’s every room has a personality of its own and is meticulously appointed with unique artwork. All rooms are comfortably furnished, sunny and have spectacular views. There is shower and bath in the roomy bathrooms. view of the lush green rice fields, majestic Paro Dzong and the holy Sangchoekor temple, Blue-pine wooden floor, 100% down pillows, telephone with global access, individual artwork, wireless high speed internet access, fully stocked mini-bar, Hair dryer, and an assortment of bath amenities, private patio or balcony, LCD TV. The unrivaled atmosphere and decadent options in catering menu and Bar with a fine selection of liquor are sure to please every hotel guest. Located 5 km away from Paro town on the banks of the Paro Chhu (river) the Kyichu Resort is a group of elegant cottages spread over an area of 7 acres. Kyichu Resort paroThe uniquely designed cottages sprawl in a landscape carefully designed to allow for individual privacy in an open environment. The Resort prides itself as a doorway to the essence of Bhutanese hospitality, where the warmth and comforts of a friendly service is a norm. The sound of the nearby river coupled with the whisper of pines is sure to give you a sensational feeling of being close to nature at its best. 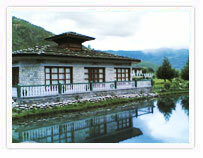 Other recreational activities such as boating on natural lakes, indigenous stone bathing, sauna and an ayurvedic center. The resort strives to offer both the essential ingredients of the meaning of its name by endeavoring to give a gratifying service and letting its clientele enjoy the peace and tranquility of the serene location. Located 20 minute drive from the international airport at Paro, Dhey Kyed Resort is situated on a gentle slope overlooking the spectacular Paro Dheykyed exteriorvalley with the meandering Paro Chu (river) and the beautiful paddy fields. From the resort, guests can get a fabulous view of the villagers going about their daily toils in the fields according to the beautiful changing season: plowing and tilling the terraced fields for rice plantation; planting vegetables in summer and sowing wheat in winter. The resort offers a stunning sight of the valley at sunrise. With a rich lush green pine forest behind and magnificent mountains in the front, Dhey Kyed Resort boasts of having one of the finest location at Paro. The resort offers 16 well furnished standard rooms with independent veranda, 3 executive and 2 deluxe rooms. 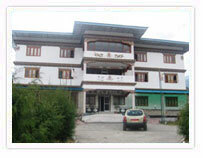 All rooms are well equipped with necessary amenities like television, telephone, panel heaters. The toilets have 24 hours hot water supply, comfy bath tubs and toiletries exclusively made for resort. It provides fine dining with its selection of delicious Bhutanese, Chinese and Continental cuisine at the beautifully located restaurant “Zhe Go Za Gey”. Adjacent to the dining, is a cozy bar with selection of international and local beverages. The resort also offers a fully equipped conference hall which can accommodate 40 participants. In addition to TV, international dialing facility, fax and photocopy, the resort has good business centre with broad band services. Foreign exchange, laundry services are also available. Here guests can experience a traditional hot stone bath in the wooden tubs where water is heated with red hot stones burnt over fire. The stones are collected from the Paro river bed. Local herbs are added to give medicinal value and fine aroma. Next to the hot stone bath house is the massage room where experienced masseurs will soothe your aching body. Ideally located in the heart of Paro valley, about 3 km from Paro International Airport, Hotel Tashi Phuntshok is a familiar and distinctive landmark. Built in traditional architecture, the Hotel Tashi Phuntshok Parohotel features 33 elegantly furnished rooms in form of superior deluxe rooms (02), deluxe double rooms (27), deluxe single rooms (02) and standard single rooms (02). All rooms are attached with spacious bath, running hot & cold water, direct dial STD / ISD and also provide bath slipper, bath gown, shower cap, shampoo, bath soap, bath gel, tooth brush & paste. Spa including massage and beauty care, open coffee tarries and an interesting gift shop. The restaurant which boasts of serving the finest multi - cuisine including Bhutanese, Indian, Chinese and Continental, while bar offers interesting collection of international as well as local beverages. The hotel is known for its quality services and also ensures that guests experience longer engagement with local communities for greater cultural and traditional insights of the country. Rinchen Ling Lodge is about 7 Km from the main Paro town towards Drukgyel Dzong, and about 62 KM (1.1/2 hours) from Thimphu. The holy abode of Guru Rinpoche, Taktsang is only two hours walk from the lodge. Hotel has the Dinning Block with 8 double rooms on the first floor. The décor is mostly natural pinewood and gives one a warm and homely feel. These rooms are spacious and well appointed. 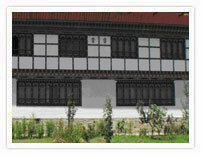 Adjacent to main building there is a three storied Block with 9 Double rooms. The view from the 6 deluxe rooms on the first and second floors are excellent. Surrounded by the scenic beauty of Paro Valley, Gangteypalace HotelGangtey Palace offers a unique place to stay and relax in an intimacy of a family home. The hotel is set in a 20 acres apple orchard that commands superb view of the quiet Paro valley and majestic peaks of eastern Himalayan range. Fresh water to the hotel is supplied from the nearby mountain spring that is said to be protected by a legendry deity who makes sure that the sanctity of water is well maintained. 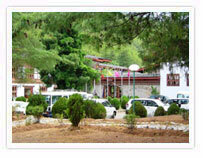 Gangtey Palace is proud of its traditional approach to hospitality. Rooms are excellent with all bedrooms offering en-suite bathroom facilities. 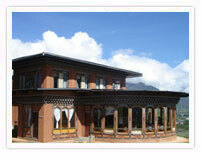 The rooms are Bhutanese in style and décor without any television or phone interference. The rooms in the Utsi (main building) display a five layered carved decoration denoting the aristocratic standing of the house. The structure was built using indigenous materials such as stone, mud and wood. The outside wall of the Utsi is over 10 feet thick providing its fortification. In the true style of Bhutanese architecture the stone and mud walls provide insulation in the Winter and a cool environment in the Summer. 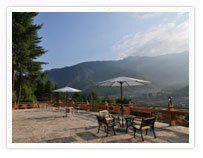 Lounge and Bar – well stocked bar and lounge with wide window to enjoy scenic Paro valley and surrounding mountain. TV is only available in the lounge. International phone and internet facilities are available at reception. 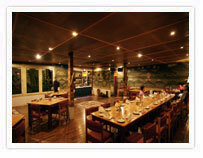 Restaurant: serves continental, Asian & local cuisines.